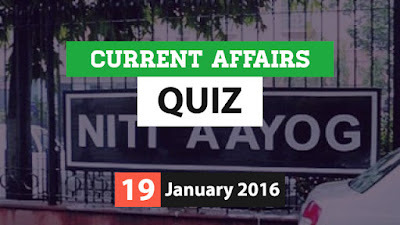 Hi Aspirants..Here is the Current Affairs Quiz for 19 January 2016. Attempt the quiz and share your score. Q1. Which Indian has been elected to the board of directors of the China-sponsored Asian Infrastructure Investment Bank (AIIB)? Q2. 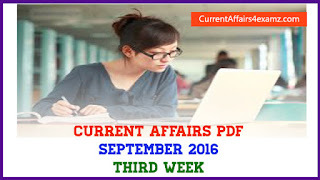 Ventrapragada Rama Rao who died on 17 January 2016 was the former governor of? Q3. National Institution for Transforming India (NITI) Aayog on 17 January 2016 collaborated with which bank to conduct an enterprise survey of manufacturing firms? Q4. Which team on 17 January 2016 won the 2016 Premier Badminton League title? Q5. Gideon Kipketer who won the men's race in Mumbai Marathon on 17 January 2016 belongs to which country? Q6. Which state Assembly on 15 January 2016 approved reclassification of coconut tree as palm? Q7. Which state recently becomes India’s first fully organic state? Q8. Guenter Butschek was on 18 January 2016 appointed as MD and CEO of? Q9. Ronnie O'Sullivan who recently won the sixth Snooker Masters title belongs to which country? Q10. What was India's rank in the global talent competitiveness report released recently?